Founder and General Overseer of the International Central Gospel Church, Dr. Mensa Otabil has retained his eminent position as the Most Influential Ghanaian Pastor on Social Media in the 2017 Ghana Rankings. 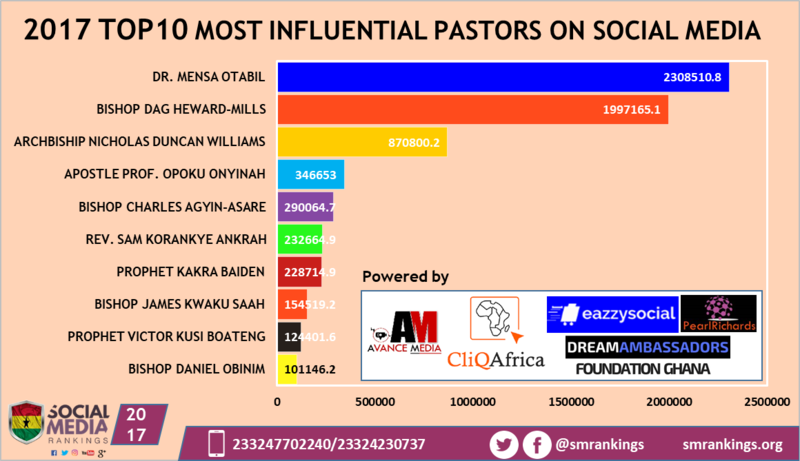 Records from the report published on smrankings indicate, Dr. Mensa Otabil also had a more engaging Social Media presence across Facebook, Twitter and Instagram. 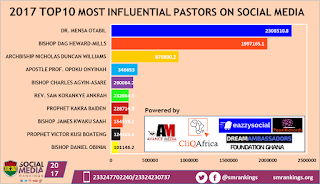 Bishop Dag Heward Mills was also noted to have amassed the over 450,000 new followers in the 2017 making the most followed pastor on Social Media in Ghana. Newest entrant on the list is Bishop Daniel Obinim who displaced Pastor Eastwood Anaba from the previous lists to clinged the 10th position. The 2017 Ghana Social Media Rankings was conducted by Avance Media, CliQAfrica, eazzysocial and Dream Ambassadors Foundation GH in partnership Pearl Richards Foundation.